We're often quick to frame a pleasing-to-look-at shot on Instagram and hit Share without much thought. But, it is not until we learn to look--really look--that we can appreciate what's right in front of us. That's the premise of this month's Elevate the Ordinary Instagram Challenge: Reframing Your Perspective to See (and Attract) the Positive. "Photography is about vision -- real or perceived. Before we take the camera out of the bag we must first learn to look at what we are seeing, and to see at which we are looking." -Dale Wilson, "For Beginners - Learning to See"
Looking requires us to break down our surroundings into fundamental shapes and colors. To abstract them from expectation. To observe from all sides: above, below, under, next to. And to re-envision them. This is the approach I take with both my My Ordinary 365 and The Scene Today Instagram Series. And why I'm challenging you to join me this month for 30 Days of Elevating the Ordinary; a group Scene Today exercise. Why this month? The beginning of Spring seemed a perfect time to stop and take another look at the details of our lives. 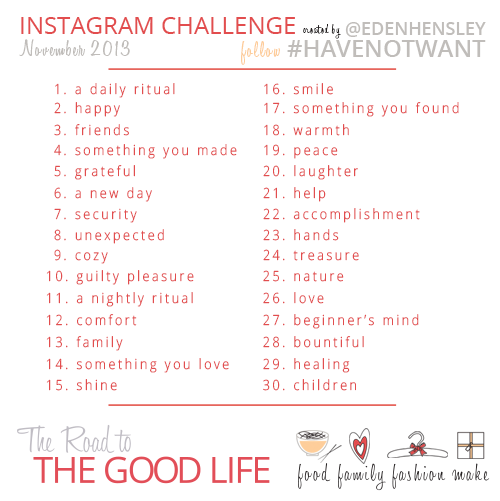 To help us see our own lives from another perspective, I've put together 30 prompts, half of common objects and half of moments or emotions, for the Elevate the Ordinary Instagram Challenge. Elevate the Ordinary is designed for you to tell your story visually, introducing yourself (who are you), setting the stage (where are you), showing your day (what do you do), and revealing what's unique about what you do (how do you do what you do). Choose your level of commitment one day, one week, or all thirty days. There's no right or wrong way to participate. Take a photo with your iPhone and share it on Instagram using #ElevatetheOrdinary and/or elsewhere on your blog or social media. Encourage vision. It's scary to put yourself out there and try something new. As Hilary says: "Be generous with your likes and your words of affirmation, sharing only positivity and words that will make one another authentically glow." 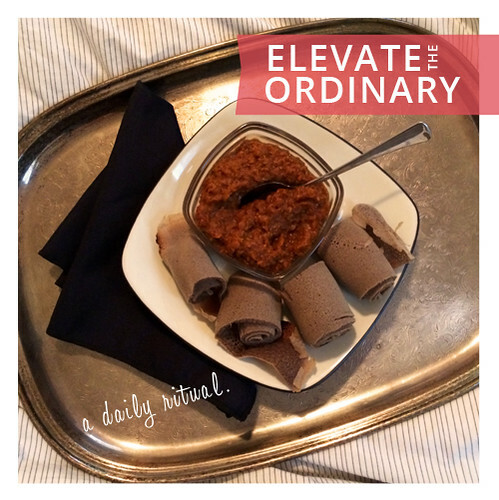 Will you join me and Elevate the Ordinary in your life? "It pays off. Suddenly you begin to see wonderful things in your daily life you never noticed. ... Training the eye is very important. You can't come up with ideas if you don't see first." -Inge Druckery, "Teaching to See"
As part of my job as a marketeer I'm tasked with making events unique and getting people to come back again. One takeaway I give participants is a keepsake photo album using all of the images guests took. The keepsake has an overall narrative describing what we did and includes snippets from people's social streams for color--what we were feeling or learning. Rarely do I use photos as is. More often than not I crop them to highlight a detail to visually support the story I want to tell and the emotion I want to relive. After receiving an album, I'm often asked for tips on how to improve composition when shooting. The short answer is practice. Take an ordinary object and photograph it from all angles in all sorts of light and repeat with another object and another. Try to show action where there is none. Life when there are no humans or animals. Give yourself constraints and practice showing an absence in your image. I also point them to two online resources: a documentary on Inge Druckery, Teaching to See, and Dale Wilson's Eleven-Part Learning to See Series on Digital Photography School. The documentary gives you insight into how students of Inge Druckery were able to apply learning to see in their everyday lives and work. And Dale Wilson has a series of exercises you can work through to practice learning to see. I learned to see when I got my first camera. It was a simple Kodak Instachrome 110. It had a fixed focal length and relied on the speed of the film to determine how crisp photos would be in daylight (100) and inside (400) and for portraits/still lifes (100) and action shots (400). When framing a shot you had to remember the film speed and adjust your vision for a shot if you had the "wrong" speed. I got frustrated easily. I was twelve and I picked up most things with little to no effort. I'd point and shoot and assume what I saw was what would be captured. Disgusted that this wasn't true, I discarded abstract waves of color remembering the tulip details I'd been trying to capture. My mom picked up my photo and grabbed a book of Monet's paintings. I forget which painting she held the photo up next to, but I saw the similarities. I realized photography doesn't have to be an exact replica of an object. A photographer through their shot can convey action when there is none. Emotion when there are no people. I was lucky enough that summer to train with a few of San Francisco's nature photographers at the Junior Academy at the California Academy of Sciences. (It's a program that no longer exists that should, but that's a post for another day.) The only required equipment was a camera. I was either the only child without a 35mm camera or one of the few. I'd follow some of the older kids with their zoom lenses and try to mirror their shots with my camera: the most memorable being hang gliders at Fort Funston. Our teacher saw me and explained the difference between what the eye can capture and what film could capture. I'd just shot all of my exposures so I wasn't able to practice what she was saying but I took the message to heart. I could have a roll of vibrant color, shots of the hang gliders on the ground. Of the action of preparing to launch. Instead of almost twenty shots of blue sky with a tiny undistinguishable dot. Learning to see has allowed me to challenge the status quo or expected ways of doing things. It's why I've always believed "it can't be done" just means no one's looked at the problem from a different perspective. It's why I've looked at blocked paths or opportunities only available to a few and crafted new paths to get the opportunities I wanted. For me, learning to see gave me what Marie Forleo calls "Figureoutability" an approach that applies universally to any endeavor: personal or professional.